I'll be honest, this book was incredibly disappointing and really hard for me to get through. The whole reading experience was something like wax fruit: It looks shiny, juicy and delicious, and your mouth waters anticipating the sweet, tangy taste...but you bite into it and it's just waxy sawdust, a cruel shock to the taste buds and to the mind itself. Theodore Rex was so different from the first book in the series, The Rise of Theodore Roosevelt, and not in a good way. It took me months to get through, just because I never wanted to pick it up, and at one point I wrote in my notes: "I cannot wait for this book to end." I almost NEVER say that, and it's all the sadder because of how enchanting the first book in the series was. What happened?!?!? For me the biggest draw to these biographies of Theodore Roosevelt was the vibrant and eccentric personality of the man himself. I know he didn't lose that personality when he became President (those 8 years are the sole focus of this book), but it was buried under the tons of politics that were the real main character of Theodore Rex, not Teddy himself. I know I may be biased on this front because I am really not very interested in reading about politics. The writing itself is actually very good; Edmund Morris clearly has a gift with words and his phrasing and imagery are beautiful and memorable. But the content...there is hardly any of Theodore's personal life in this book, and that would be alright if this were a political history, but it's a biography! There were a whopping TWO SENTENCES devoted to his son's near-death after a 9-day struggle with diphtheria, and then it returned to the politics...seriously!?! 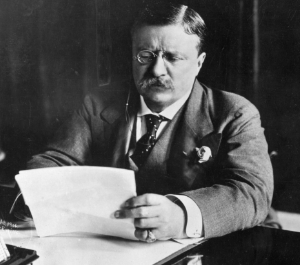 President Roosevelt, circa 1905, doing some paperwork. The book starts with Theodore's journey to the White House after President McKinley died. It teases the reader with how he leapt off his horse and kicked aside a pack of hounds so he could knife a cougar (there's the Teddy I know and love!) but doesn't expand on it at all. There is a great deal of content on economy, finance, commerce, and industry, which I found really boring. The book covers (in great detail) the Panama Canal, the Russo-Japanese War, civil rights issues and anti-lynching campaigns, independence for Cuba, the Venezuela Crisis, and Theodore's re-election to a second term. To be fair, Morris covered all these issues adeptly and with great skill, and those matters are not altogether without interest. 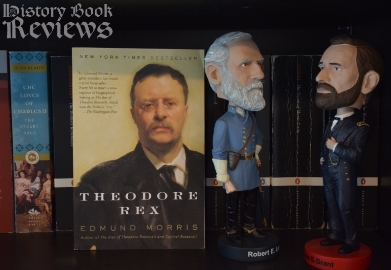 But it is not what I expected or wanted in a biography of Theodore Roosevelt, the man. People called Roosevelt the "strangest creature the White House ever held". He forced all his luncheon guests to go on afternoon wilderness treks with him, to their great distress. He tiptoed behind people while they walked the grounds, shot at twigs and stumps from horseback with live ammunition, and hung by cables over the Potomac to strengthen his wrists. He took his children camping in the summers, pretending to be a bear and teaching them to wrestle (even his daughters), at night telling them ghost stories before curling up his sleeping bag. He had two surgeries to scrape a tumor off his shin bone, and he refused anesthesia. He accepted live badgers as gifts from children, and when he won at tennis he would "rejoice with falsetto shrieks, and hop around on one foot, singing and laughing." His favorite exercise routine was 'Singlesticks', where he and a friend wore protective padding and literally beat each other with sticks for hours. Is there anyone who wouldn't want to know more about this man??? Sadly, these quirks and personal stories are extremely few and far between in Theodore Rex. There was some good content on Theodore Roosevelt's conservation work. He saw natural wilderness and parks as more holy and spiritual than any church, and he devoted a lot of time and energy to preserve them. He proclaimed many national monuments, forests, and bird refugees, and did America a great service by making conservation an important part of our culture. Yet for all the text spent on topics like this, there is inexplicable silence about his family life, his wife Edith and all his children. The only relationship Morris delves into at all is that of Teddy and his eldest daughter Alice, who was kind of a troubled teen. I don't even know the names of his other children--and that's after reading two books now about him. In the end, I still adore Theodore Roosevelt and find him hilarious, but even his larger-than-life magnetism and bizarre charm were almost obscured by the politics of the years 1901-1909, which was a real shame. The book ends with him leaving the White House, bound for Africa, which he had been obsessed with for years. I can only hope that the third and final book in the series, Colonel Roosevelt, will be better since he will again be a private citizen, but I must admit I don't feel any great desire to pick it up after finishing this book. I will only do it because I can't bear to leave Theodore Roosevelt yet, and learn ever more details of his ridiculous, amazing personality. 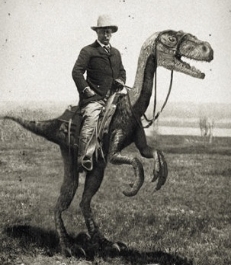 Theodore Roosevelt riding a dinosaur. This may be one of the most incredible things I have ever seen.